Visit any Justice store in the U.S. or Justice online and shop their sale. 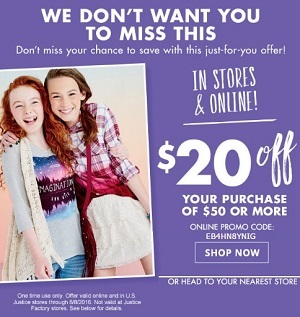 You can take $20 off your purchase of $50 or more. To receive the offer online use promo code at checkout. Hurry up, offer ends today (08/08/2016). Source of the information is Justice. For more information visit any Justice store location in the U.S. or Justice online.